It’s the ghoulish time of the year again and people are turning their homes into haunted houses to get into the spirit of Halloween. 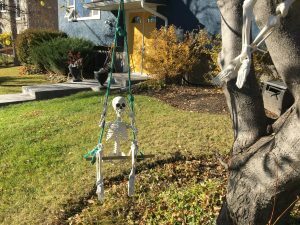 Although it’s unclear where and when the tradition of decorating one’s home every late October began, it is clear that it is a popular pursuit for thousands of Calgary homeowners. Scott Bennie, owner of Don’s Hobby Shop in Calgary, has seen the growth in popularity over the years by homeowners. 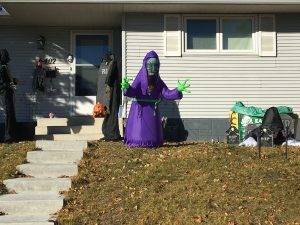 The store sells costumes for the Halloween period but its business also involves selling items for homeowners who are looking to make their abodes stand out in their neighbourhoods. “Skulls, candy dishes, spider webs, table cloths, witches cauldrons, spiders, lots of different skeletons,” says Bennie, who provides the products year-round but obviously the interest perks up when October 1 hits and people shift into Halloween mode. This year Halloween on October 31 falls on a Wednesday. “We try different items every year. Different new things. Our suppliers come out with different things. This year we have some pumpkin carving kits that come with stencils. So if you’re not artistic you can still pull off a really good-looking carved pumpkin because you have all these different ideas with the stencils that you trace and cut out yourself,” says Bennie. Bennie has noticed that people now also get into decorating their homes earlier – early October for many nowadays. The Jack-o’lanterns and gravestones and mummies are popular ways to spruce up a home during this festive and fun time of the year which really does kick off the lead into Christmas. If you are looking for ideas on how to make your home Halloween friendly, the Internet offers tons of easy to use options. Just Google Halloween and home decorating and you’ve opened up a world of creativity and fantasy. But make sure you keep one thing in mind. Halloween evening is all about the young kids enjoying themselves trick or treating as they visit one home to another. So make sure your homes and properties are safe as they wander around the neighbourhood.